Carte particuliere de la cote occidentale d'Escosse, depuis la Pointe d'Ardnamurchan jusqu'au Mull de Galloway. 2 Blätter : 91 x 76 cm s.n. 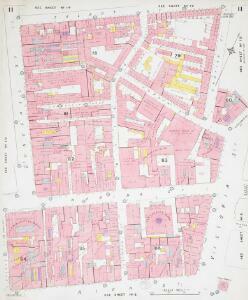 Description: This detailed 1887 plan of Belfast is one of a series of fourteen sheets in an atlas originally produced to aid insurance companies in assessing fire risks. The building footprints, their use (commercial, residential, educational, etc. ), the number of floors and the height of the building, as well as construction materials (and thus risk of burning) and special fire hazards (chemicals, kilns, ovens) were documented in order to estimate premiums. Names of individual businesses, property lines, and addresses were also often recorded. Together these maps provide a rich historical shapshot of the commercial activity and urban landscape of towns and cities at the time. The British Library holds a comprehensive collection of fire insurance plans produced by the London-based firm Charles E. Goad Ltd. dating back to 1885. These plans were made for most important towns and cities of the British Isles at the scales of 1:480 (1 inch to 40 feet), as well as many foreign towns at 1:600 (1 inch to 50 feet).